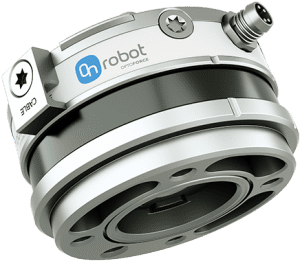 OnRobot 6-axis force torque sensors provide 6 degrees of freedom, force and torque measurement. Our sensors are designed to fit a wide range of the currently used industrial and collaborative robot arms. Integration with various available interfaces is simple. Common applications are force control devices, teach-in activities and crash detection, but the sensors can be used next to end-effectors in case of grinding, polishing or deburring tools.